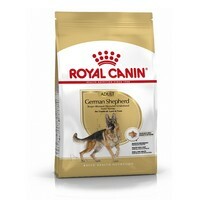 Royal Canin German Shepherd Adult is a complete diet for adult and mature German Shepherds over 15 months of age. Designed for the specific requirements of German Shepherds, the food has been made with high quality ingredients including vitamins and minerals and provides optimum support for their unique physiology. Rice, Dehydrated Poultry Protein, Animal Fats, Vegetable Protein Isolate*, Maize Flour, Vegetable Fibres, Hydrolysed Animal Proteins, Minerals, Beet Pulp, Soya Oil, Fish Oil, Copra Oil, Hydrolysed Yeast (Source Of Manno-Oligosaccharides), Hydrolysed Crustaceans (Source Of Glucosamine), Green Tea And Grape Extracts (Source Of Polyphenols), Marigold Extract (Source Of Lutein), Hydrolysed Cartilage (Source Of Chondroitin).